Running in the winter takes lots of dedication – and preparation. Bitter cold, wind and snow make it easy to stay in bed and skip your morning run. Once you find the motivation to head outside, you’ll be greeted by dark, slippery roadways. However, all is not lost. If you take the necessary precautions during winter runs, you’ll be fast and fit when spring finally arrives! 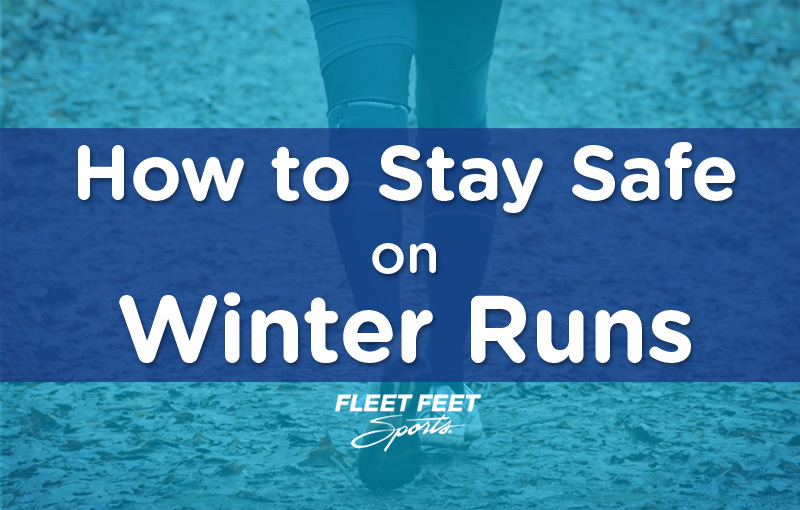 Here are ten tips to keep you safe during the winter running season. With less daylight, it can be hard to find time to run when the sun is out. In fact, visibility is lowest at dusk and dawn, making it especially difficult for drivers to see you. When you run in the evening or early morning, wear highly reflective clothing and attach blinking lights to the front and back of your jacket. Surfaces covered with snow and ice are slipperiest when temperatures are near the freezing point. Surprisingly, snow and ice have more traction when temperatures get colder. Items like Yak Tracks or attaching spikes in your older sneakers can give you more traction in slippery conditions. Public spaces like industrial office parks and college campuses are usually quickly cleared and regularly maintained by their own staff. You can run on a well-lit, clear path with minimal traffic. When you run facing traffic, you can see what is coming and move out of the way. Keep in mind snowbanks make you less visible, so be extremely cautious when entering intersections and crossing roads. Run the first half of your run into the wind, then have it at your back for the return trip. On the second half of your run, you will feel warmer and finish stronger. Don’t forget about hydration in the winter! Be sure to drink lots of fluids and carry an electrolyte drink with you on long runs. We have various fuel belts and Nuun tablets to keep you hydrated throughout the winter. You may know the path like the back of your hand, but black ice can be treacherous. Stick to well-lit paths or wear a head-lamp when it’s dark outside. Running with a friend makes both of you more visible, and you can help each other in case of an emergency. Join our Winter Warrior Program and you can make running buddies, receive tips, and win prizes! When you run alone, carry your cell phone and be sure to let someone know your route and estimated finish time. Friends and family will know where you’re running and when to expect you home. There are always a few wicked winter days when the conditions for running outdoors are miserable. Shifting your workout indoors may be the difference between a healthy training season and one spent nursing an injury. Have a safe winter running! Do you need tips for how to dress and stay warm on cold days? Check out our Cold Weather Running Tips.